Ready to attend a public meeting of the Search Committee of the McHenry County Mental Health Board at 7 AM Thursday morning? 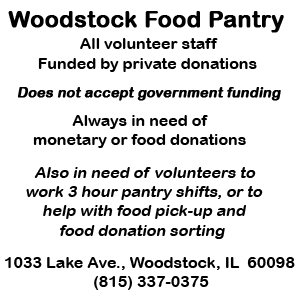 As of 1:30 on Wednesday, there’s not notice of it on the County’s web site. 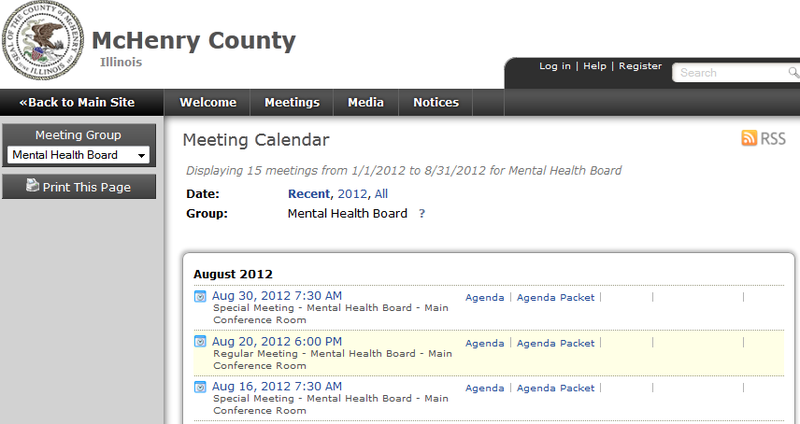 While it is not required for the Mental Health Board to post its meetings on McHenry County’s calendar, it certainly would be helpful. Note that the Special Board meeting at 7:30 AM on August 30th is listed, the & AM meeting of the Search Committee is not. 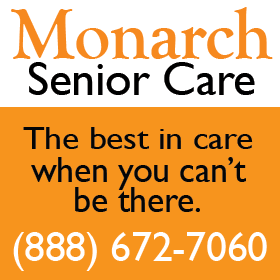 The Special Board Meeting at 7:30 AM tomorrow is listed on the County calendar, but the 7 AM committee meeting is not. Both the 7 AM Search Committee meeting and the 7:30 AM Special Board meeting are listed on the Mental Health Board’s calendar. So, if one looks in the right place, members of the public would be able to discover when the meetings are to be held Thursday. The next question is what the meetings are all about. 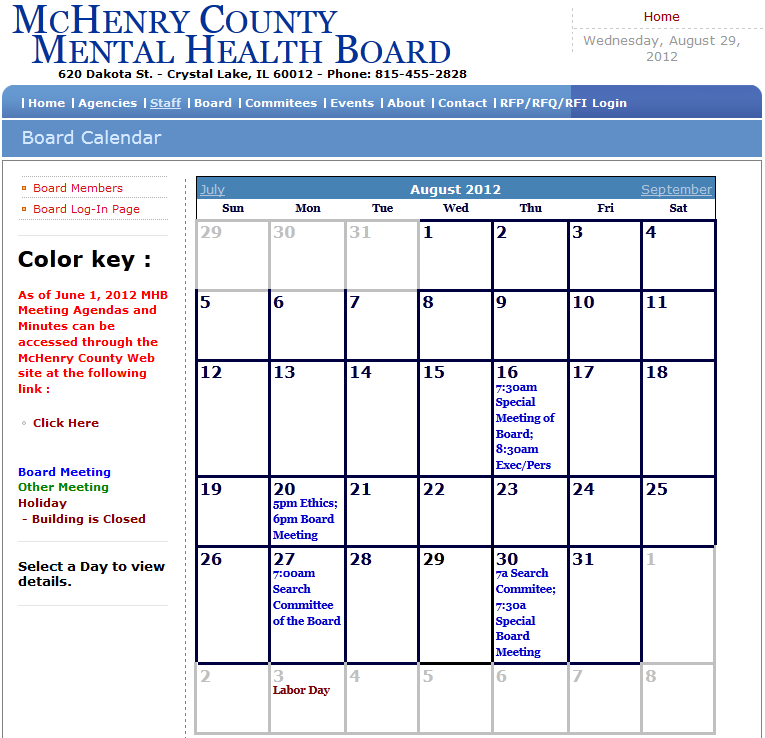 “As of June 1, 2012 MHB Meeting Agendas and Minutes can be accessed through the McHenry County Web site at the following link: Click Here,” is the message at the left of the calendar on the Mental Health Board web site. So, I clicked and found the screen at the top of this article. 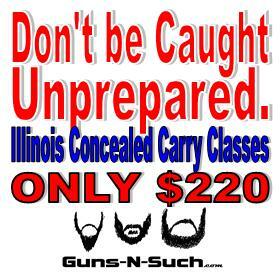 Remember there is no information about the committee meeting, so no way to get the Agenda for it. 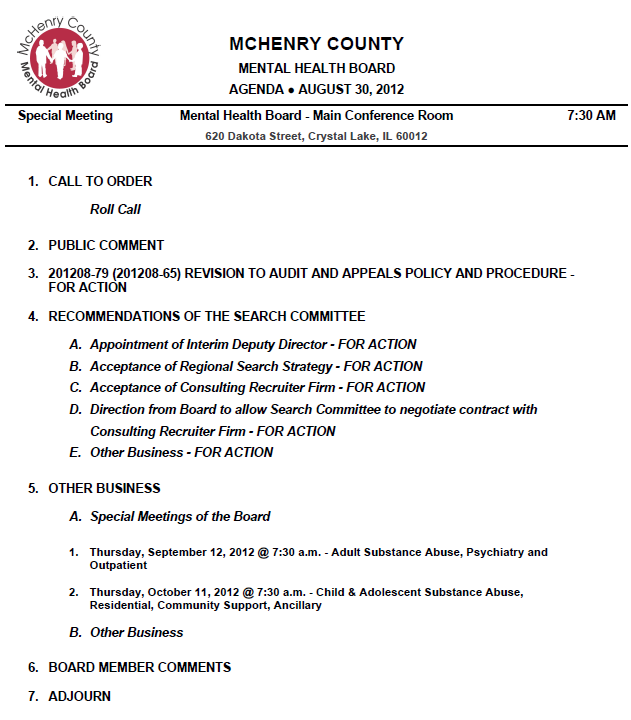 This is the agenda for the 7:30 AM Special Meeting of the McHenry County Mental Health Board on August 30th. 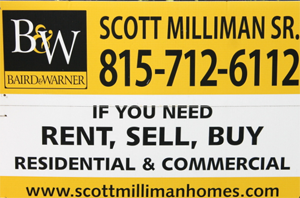 The Agenda’s first item is the revision of the appeal procedures that were discussed at both the Ethics and Compliance Committee meeting on August 20th and the Board meeting afterward. No way to find out before the meeting. When I clicked on the “Agenda Packet” tab at the County’s web site (to which, remember, the Mental Health Board points to), all one can find is another copy of the Agenda you see above. 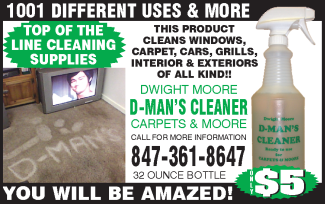 So, what are the revisions to the new appeals procedure that I did my best to explain here? If you get up in time for the 7:30 meeting, you can find out.